Our kennel for Dalmatian dogs falls under the strict German rules with regard to the breeding regulations. We are a member of the Dalmatiner Verein Deutschand (DVD) (Dalmatian Club Germany) and the Nederlandse Club voor Dalmatische Honden (NCDH) (Dutch Club for Dalmatian Dogs). Our kennel meets Germany’s strict regulations for keeping and breeding Dalmatian dogs and we have the so-called “VDH Zuchterziegel”. Unlike in the Netherlands, as a breeder in Germany you have to be in the possession of a separate heated and lit spacious puppy area that has to be directly adjacent to an outdoor area with a playing meadow and an walking area. Sadly, it is allowed in the Netherlands to breed litters on the 10th floor of an apartment flat in the drawer of a closet. We have actually seen this before. 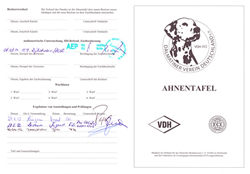 Furthermore, all breeding dogs of our German breed club get a behaviour test. A Dalmatian dog can after all not show and anxious or aggressive behaviour. A dog with these character traits will be excluded from the breed. Besides all strict regulations of the German breed club, we also generously meet all regulations of the Nederlandse Club voor Dalmatische honden (NCDH) (Dutch Club for Dalmatian Dogs). Our kennel for Dalmatian dogs Dalmacademy’s has been internationally registered from the start with Fédération Cynologique Internationale (FCI), a worldwide umbrella organisation in the field of purebred dogs (Cynology). The FCI is a collaboration of a large number of national kennel clubs, including the “Raad van Beheer” and the VDH. All of our dogs are in the possession of a so-called “Zuchtzulassing”. This “Zuchtzulassung” is an examination by a qualified judge”. This examination includes a number of important things for breeding, such as the judgment of the character of the dog. Without this extensive inspection, you are not allowed to breed with the dog in Germany, and the puppies can therefore not have the acknowledged and official FCI pedigrees. This examination provides the buyer with an additional guarantee that you are dealing with a responsible breeder with suitable and approved Dalmatian dogs. So, if you buy a puppy from us, it will have an official FCI pedigree. We guarantee a high quality kennel that has spent heart and soul for the Dalmatian for more than 20 years.